Why buy Anti-Spatter? Anti-spatter is needed to protect your welder and machine surfaces from welding spatter. Nozzle dips and gels are also available to help prevent spatter build up on your torch. Already got build up? Clean up spatter build up with Spatter Release solutions. 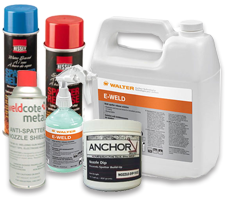 Weldfabulous offers anti-spatter solutions from top brands like Walter, Bessey, and Weldcote Metals.